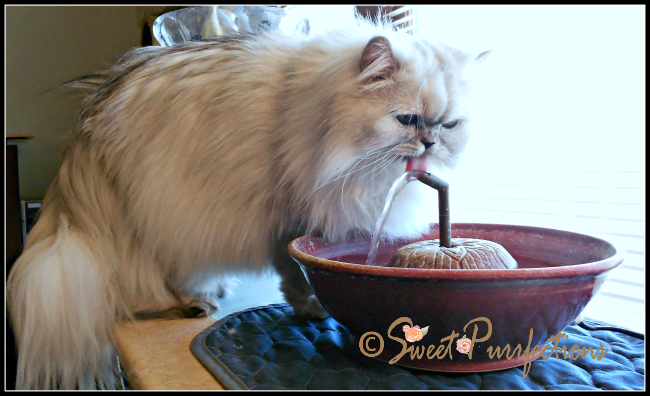 Truffle shows how a beautiful Persian ladycat can participate in Tongue Out Tuesday while drinking water from her fancy ThirstyCat Fountain. We hope everyone has a wonderful day. Truffle drinking from her ThirstyCat Fountain. I love your fountain, Truffle! Such a gorgeous girl! I love Truffle's silver shading. And that fountain is pretty cool too! Cute tongue and yummy sips! What a pretty way to show a lil tongue! Purrfect photo for tongue out tuesday! You do it so lady like. Sure looks like you are enjoying that fountain Truffles. Hope you all have a wonderful Thanksgiving. You are a most elegant LadyCat! So prim and proper. Such a cute little tongue, you are adorable. So elegant! And that really is a beautiful fountain. That looks like a fun fountain. How's the water today?